The writing team is happy to announce that we have released the September 20 update for the Office 365 for IT Pros (2019 edition) eBook. This is update 6 for the 2019 edition. We know that Microsoft has many announcements for Office 365 and Microsoft 365 technologies lined up for the Ignite 2018 conference next week, and we wanted to make sure that we got anything that needed to be updated into this release to be able to concentrate on what we hear about in Orlando. 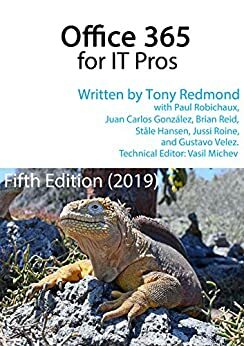 We expect to hear news about Exchange, Teams, SharePoint, OneDrive for Business, Planner, Azure Active Directory, and all the other topics we cover in the book. Fifteen chapters are updated in the September 20 release. Full details of all changes to the book are in the change log. If you bought the PDF/EPUB version of the book from Gumroad, please download it from that site using the link in your receipt (see our FAQ for more information). If you bought the Kindle version from Amazon, please follow their guidelines to download the updated files. The next release is likely to be in late-October. It all depends on what we hear next week, when we have access to the updated software, whether we hit any problems with that software, and the time needed to write and update chapters. We’ll do our best to understand and test new features thoroughly before we commit anything to (electronic) paper. Is this a new edition or an update to the 5th edition? I’m a little confused, since updates to existing editions used to be free (part of our “subscription”). I can’t find any way to get this update without purchasing the book again. This is an update to the 5th edition (2019 edition). When you buy an edition, you get a subscription for that edition and all of the updates issued for that edition. You don’t have to pay anything else for any update issued for the edition you buy. Enjoy the update! OK. So where do I get the update, as a link to it is not obvious. Everything’s explained (we think) in the FAQ: https://office365foritpros.com/faq/ Essentially, log onto gumroad.com with your account and you’ll be able to download the updated files. Not to be obtuse, Tony, but if it were that obvious I would not have asked the question. I don’t see anything that say “log onto gumroad.com to get your free updates, or anything remotely like it. Nor is there an obvious (or even not so obvious) link to gunroad.com. I’ll keep looking, though. I thought that the information was clear but have followed your advice to hopefully clarify and expand on the point. OK, so I’ve logged in to gumroad.com, but I couldn’t locate the download files until I clicked “View Product”. Would it have been so hard for whoever set up this page to label that button “Download what you’ve already paid for”? Yes, I now that’s a bit much, but I’m irritated that apparently non one associated with this publication can figure out how to make things user friendly – including information like: “You can use your pratical365.com credentials to log into gumroad.com”. A link to gumroad.com would have taken all of 5 seconds to create, along with a statement that the login button doesn’t work in IE, so you’ll have to use Chrome or Safari, or any other browser that the IE haters love. Please forgive my rant. It results from the unusually long time it has taken for me to finally locate the downloads. Along with the points made above, a little selective bold-faced type would have helped. Thanks Bob. The View Product link is from Gumroad and is controlled by them, so I will pass your comment on to them. They act as the distribution point for many other kinds of products and I guess they’re trying to come up with something that is product neutral. You can’t use your practical365.com credentials with Gumroad. The two sites are completely different. However, you as an individual can use the same username (email address) and password if you like. Hello Tony, thank you for regularly updating your book with the latest changes. I only have a tiny little problem and would be happy if you had a tip or a workaround for me. Every time I update your book, I overwrite the old version of the book with it. Unfortunately, I lose all my comments and bookmarks. When I save the new edition of the book next to the older edition, I keep the annotations and bookmarks, but logically they still refer to the old version. Do you know a way how I can move the bookmarks and notes to the new edition of the book? I use Calibre to manage my books. By the way, with Calibre I can also convert a book from .epub to .mobi to read it on a Kindle. I don’t have a great method for you to keep annotations and bookmarks. Some people use OneNote for this purpose. And Calibre is a great way to convert books. We use it to generate the Kindle content for the book.